PAUL DERVAN: "The most useful book about advertising that I have ever read"
"The most useful book about advertising that I have ever read"
I'm pretty sure I first heard about this while reading Drayton Bird's Commonsense Direct Marketing. If I remember correctly, he made that point that many marketeers are simply not trained in the basics and his advice to anybody starting out would be to read everything possible. His first book recommendations were Claude C. Hopkin's Scientific Advertising and this. As you can probably guess by the title, this is a practical book. John explains very simply why one advertisement will outperform another. His statements are bold because they based on tests. If you don't already understand the importance of headlines, you will after this. There are three chapters (ch.2, 3 + 4) written entirely about headlines. While this was published in 1932, it is still very, very relevant today. It has been suggested that some of his advice is not as important as as it was in the 30's. Perhaps, but I had a quick look over at amazon and wasn't surprised to see that it has a five-star rating from 42 reviews. The copy I have has a foreword by the late great David Ogilvy. 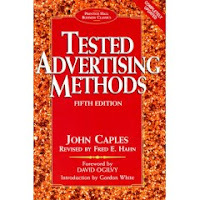 I just grabbed it off the shelf to read his quote directly - "This is, without doubt, the most useful book about advertising that I have ever read". This is a keeper. You won't give yours away.